Outsourced Customer Care Services Market size was over USD 70 billion in 2016 and is predicted to grow at an estimated CAGR of 6% from 2017 to 2024. The demand for mobility services on various platforms is anticipated to drive the outsourced customer care services market growth over the forecast timeline. Consumers have become increasingly connected due to the use of smartphones which necessitates the need for modernizing the overall user experience. A multi-channel solution enables the firms to deliver services more efficiently accompanied with insights and information to enhancing the marketing communications. As requirements are growing speedily, a more rapid shift in preference from enriched to transformational services is being witnessed in the outsourced customer care services market. There is a rising demand for instant messenger form of customer service which can be employed on various platforms. This is done to ensure that the firms are in constant touch with their clientele and can resolve the issues rapidly. The outsourced customer care services market enables firms to focus on their core competencies and offer cost savings. A large number of firms are turning towards outsourcing to attain benefits such as minimizing overhead cost, enhancing operational flexibility and increasing service levels. Customer interaction services market are anticipated to occupy a significant share over the forecast timeline. This is due to increasing demand for swiftly resolving issues and offering services and support in a customized manner. Outsourced customer care services market providers focus on creating strong consumer relationships and fulfill user demands in a way convenient for them. Effective interaction also aids the organizations to safeguard retention and augment revenues. With growing competition, customer satisfaction and customer-centric services are of prime importance for an organization. Furthermore, the service providers focus on delivering efficient pre-sales and post-sales services which offers higher-value services in order to enhance interaction. Services such as managed charging and routing, and contact center are predicted to augment sales and gain loyalty in the outsourced customer care services industry. Helpdesk services enhance the overall user experience, and improves retention. Therefore, the companies are delivering multi-channel and multi-tiered support, along with advanced services such as network troubleshooting, software and hardware support. North America is anticipated to increase its focus on outsourcing customer care services due to the rising demand for delivering active customer care and the increasing infrastructure facilities. In addition, the high cost of resources has led to offshoring to various Asian countries such as Philippines and India. The changing consumer behavior and less inbound call volumes will impact the regional outsourced customer care services market growth. The service providers in the region are expanding their technology platforms to cater to the consumers in a more efficient manner. The low cost of resources and presence of English speaking individuals characterize the LATAM market. The reduction in telecom rates, rising penetration of internet, and presence of educated, bilingual agents will escalate the demand in the region. Furthermore, the time zone and geographic proximity similarity of Latin America to the U.S. also makes it a popular outsourcing destination. Industry players include Aegis, Synnex Corporation, Accenture, Expert Global Solutions, Amdocs, StarTek, Convergys Corporation, and Transcom Worldwide. Owing to the presence of several industry players, players are concentrating on expanding their services and increasing acquisitions to gain prominence. For instance, in 2015, Microsoft Corp and Infosys partnered to provide the Finacle suite of solutions on Microsoft Azure. Outsourced customer care services market players have to comply with varying consumer requirements and deliver multichannel solutions. Vendor selection is the major decision maker for this process. Companies conduct numerous tests to confirm that they are commencing outsourcing with a reliable vendor. The growing usage of cloud-based and host-based services have made them relatively inexpensive and has increased the penetration into SMBs resulting in an increase in the market growth. 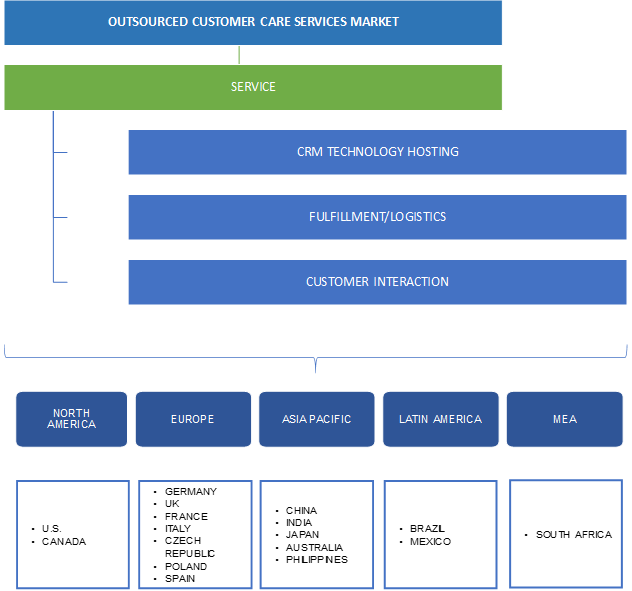 The outsourced customer care services market is offering several opportunities for companies and businesses to produce revenue, and meet requirements. These services enable the companies to better manage their consumers and cater their requirements in an efficient manner. Penetration of big data and cloud technology is anticipated to escalate the market growth over the next seven years. It also aids the firms on concentrating on their core competencies accompanied with offering cost benefits. There is a rising inclination towards the multi-channel solutions to cater the demands of the consumers. Increasing technological innovations and variations in consumer behavior are stimulating the demand for efficient market.